As we grow older, our skin’s anti-aging components, collagen and elastin, break down. This, in turn, leads to unwanted signs of aging such as wrinkles and sagging skin. The Skouras Eye & Cosmetic Centre is excited to add Thermage to our practice! Thermage is a non-surgical skin-tightening treatment that rejuvenates the face and neck as well as the area around the eyes, for beautiful, healthy-looking skin. If you would like to experience the revitalizing effects of this amazing treatment, call us to schedule a Thermage consultation. During your consultation, Dr. Skouras and his clinical staff will describe the Thermage treatment in detail and examine you to determine if you are a good candidate. Your face, neck and eye area will be examined and Dr. Skouras will ask you about your current health, medical history and lifestyle. He will also ask you which facial features you would like to enhance or improve; these may include wrinkles as well as your eyelids, jawline, lips and/or neck. The consultation will allow Dr. Skouras to determine whether Thermage is the option best suited to your needs. Dr. Skouras will also use this time to explain what you can expect from a Thermage treatment. He will give you instructions on preparing for treatment and recovering from it. He will also educate you on the rare risk of complications. 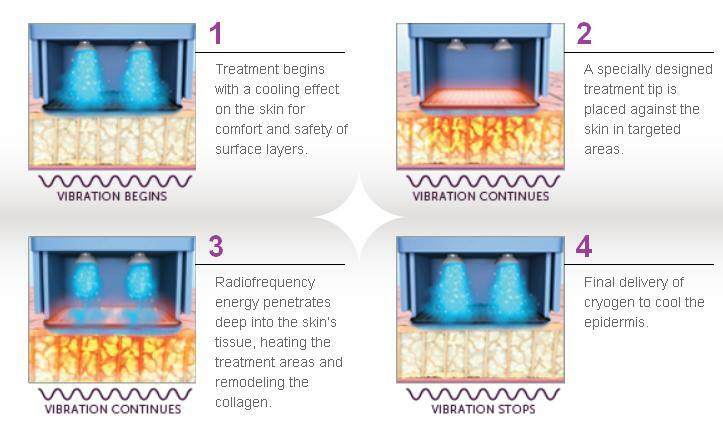 Thermage heats the deep layers of your skin and underlying tissue using radiofrequency energy. The radiofrequency energy penetrates the collagen in these tissues, creating a tightening effect in the skin. Thermage has a firming effect, as it stimulates the production of collagen. The treatment also uses cooling effects and Comfort Pulse technology for ultimate patient comfort. Thermage is a minimally invasive, non-surgical treatment that does not require incisions, anesthesia or medication and does not involve any discomfort. As our clinician moves the handpiece around the treatment area, you will feel hot and cool sensations, as well as mild vibrations. Depending on the extent of the treatment and size of the area being treated, Thermage may take anywhere from 45 minutes to two hours. Following the procedure, your skin will likely appear a bit red. However, this should subside quickly. Results are apparent almost immediately, and should continue to improve for up to six months. The outcome is typically permanent but depends on aging and your skin condition. Thermage is available for treatment of the face, neck and eyelids. There is no downtime required and it is extremely safe. Thermage has the longest history of safe and effective radiofrequency treatment of all radiofrequency therapy procedures and is the first and only FDA clearance for non-invasive eyelid treatments. Dr. Skouras and his staff have extensive experience performing Thermage treatments. They use the latest version of Thermage, which includes advanced skin protection features such as Comfort Pulse Technology and cooling effects, and provides enhanced patient comfort with minimal risk. Dr. Skouras is renowned throughout Canada for his skill and expertise with such treatments. As an experienced eye surgeon he has in-depth knowledge of the anatomy of the eyes and eyelids, and can accurately judge whether Thermage is right for each patient. Rest assured that you are in good hands with Dr. Skouras and his clinical staff when choosing Thermage at the Skouras Eye & Cosmetic Centre. If you would like to learn more about non-surgical treatments to improve the appearance of the face and neck, Thermage may be your best option. Contact our practice today by calling (416) 590-0445 to schedule a Thermage consultation.